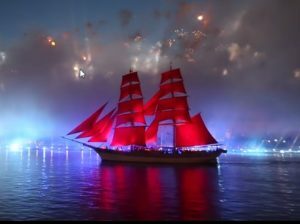 The scarlet sails holiday is one of the main events in Saint-Petersburg. However, it is not a holiday for all. It is dedicated mostly to the graduates of the schools. That is why, some areas of the city will be closed for the townspeople, as well as for the tourists. Of course, this is done for the safety of the young people. This closed ares are: the Palace square, the Dvortsovaya embankment, the Troitsky bridge (closed for all), The park is on the corner of Vasilievsky Island (closed to all) and the Peter and Paul Fortress (closed for all). Also, the movement of boats along the Neva water area will be restricted. Considering all this, the only reason to visit the area of the holiday will be the musical and pyrotechnique show, that will happen from 0:40 till 1:10. We can suggest two locations to observe this show – that will be the Palace bridge and the Birzhevoy bridge ( the bridges to the left and to the right of the corner of the Vassilievsky island). That would be wise to occupy the observation positions at least 30 minutes before the planned beginning of the show. On the night of the Scarlet Sails, from June 23 to June 24, 2017, the St. Petersburg metro will operate without closure. All metro stations will be open. Movement of trains will be carried out at increased intervals. At the ticket offices of the subway it will be possible to purchase only tokens, electronic payments will be unavailable. From 0:00 to 6:00 night buses will operate in the city on routes Nos. 8, 12, 56, 77, 80, 93, 106, 114, 130, 142, 154. The bus traffic interval will be 30 minutes.